Seresto Flea and Tick Control Collar for Dogs provides lasting protection against flea, tick and lice infestations in a single application for up to 8 months. Designed to release their active ingredients at a slow and steady rate via their innovative polymer matrix, the collars ensure a long lasting efficacy and eliminate the need for more frequent top up treatments. Flea and Ticks do more than just bite however, and can also transmit diseases, which can be harmful and even fatal for your pet. Seresto works by killing and repelling these parasites before they have a chance to bite. 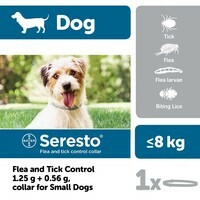 Seresto Flea and Tick Control Collars are easy-to-apply, odourless and water-resistant. Just put it on your dog for 8 months of hassle-free protection. Have used before, it works, I don't have to remember to use a spot on every month. Have marked on my calendar to buy again April 2017. I can't recommend these collars enough- 2 months ago my spaniels were picking up 8+ ticks a day in our local woods but since I've used these collars they haven't had any, and no fleas either!